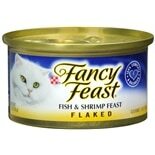 Shop Fancy Feast Flaked Gourmet Wet Cat Food Fish & Shrimp (3 oz. )3 oz. 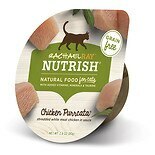 Shop Nutrish Rachel Ray Natural Wet Food for Cats Chicken Purrcata (2.8 oz. )2.8 oz. 4 for 5 dollars and 00 cents or 1 for 1 dollars and 49 cents 4/$5.00 or 1/$1.49$0.53 / oz.